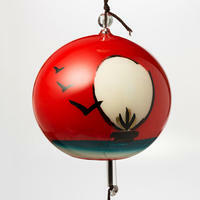 有限会社 篠原風鈴本舗 Shinohara Fu-Lin (wind-bell) Shop Inc. http://waza.tokyo/craftsman/59 「風鈴」は風を受けて音が鳴る仕組みの工芸品です。起源は中国で占いに使われた道具でした。それが日本に渡来して、お寺で厄よけとして使われていました。江戸時代末期から明治時代にかけて、江戸（東京）ではガラスの風鈴が流行しました。 「ひまわり」は夏を代表する花です。透明なガラスは「見通しがきく」という縁起のよい意味を持っています。 Wind-bell is the industrial art object which rings with the wind. 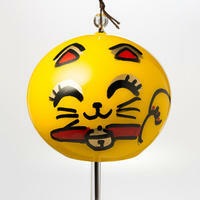 Originally, it was an instrument used for fortune-telling in China. 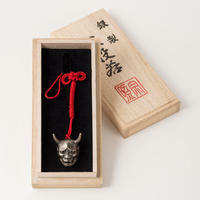 Then it was bought over to Japan and used as the charm to protect people from evil. 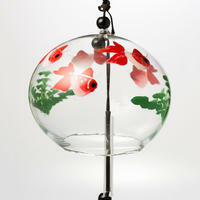 From in the end of Edo to Meiji period, the glass wind-bell became popular in Edo (Tokyo). 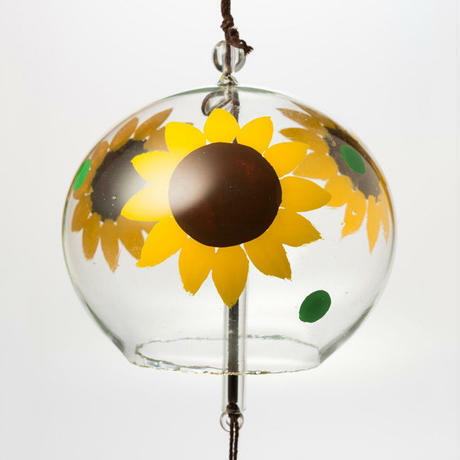 Sunflower is the most popular flower in summer. Transparent glass is considered lucky for it implies that you can see through it far into the future. Dia. 80 mm x H 70 mm [Material] Main body: glass Tanzaku: paper ・江戸風鈴は（有）篠原風鈴本舗の登録商標です。 ・江戸風鈴は音を良くするために鳴り口がギザギザになっています。お取り扱いの際にはご注意ください。 ・手作りのため、大きさや絵柄、音がひとつずつ微妙に異なります。 ・製法上、ガラス部分に気泡やしわが入ることがあります。 ・すべての風鈴に短冊がつきます。 ・ご注文をいただいてからの制作となります。制作には2週間かかります。 Edo Fu-Lin is a registered trade-mark of Shinohara Fu-Lin Shop Inc. Be careful when you handle Edo Fu-Lin because the edge of Edo Fu-Lin is purposely serrated for the good sound. The size, design and sound may vary because each Edo Fu-Lin is made by hand. 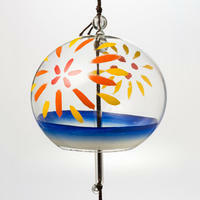 Owing to the manufacturing method, air bubbles or wrinkles may be found in the glass part. 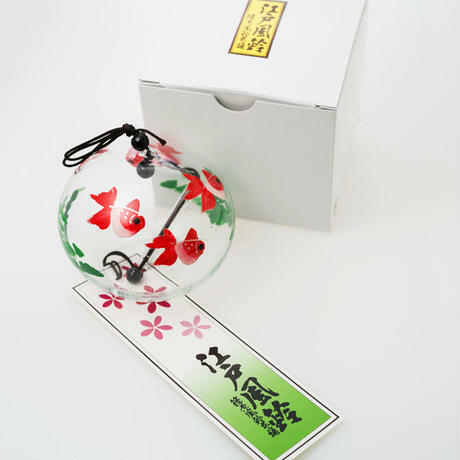 Each Edo Fu-Lin is provided with Tanzaku. 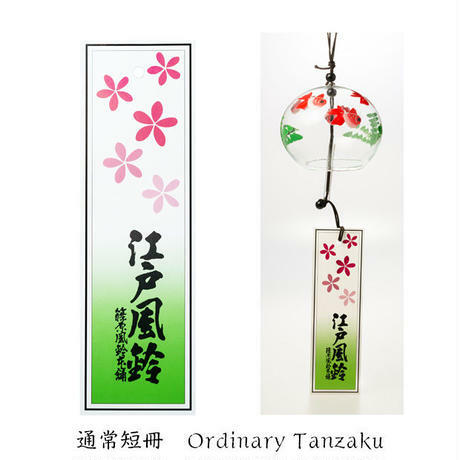 (Tanzaku is a strip of paper made to hang under Fu-Lin to catch wind.) 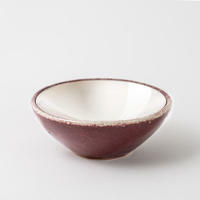 The Edo Fu-Lin is made to order. It may take two weeks to make.